Local Talk Radio Ratings Are Out. Who Is Way Down? The latest Anchorage radio ratings are out and there are surprises. A quick disclaimer first: radio ratings are a bit like trying to understand the science behind a Ouija board. The numbers can be chopped up, combed over, and analysed in a manner that fairly justifies almost any conclusion. What follows is my analysis based on my own experience in radio and talking to people behind scenes in the industry. Radio ratings are published by Arbitron Inc, who surveys the Anchorage market twice a year, once in the spring (late March-early June) and again in the fall (mid-September-early December). The most recent ratings, released at the end of July, cover this spring’s ratings period. Those ratings show two stations, KFQD and KENI, continue a neck-and-neck battle for the top stop in local the conservative news-talk format. KFQD came out on top overall with a 4.8 share to KENI’s 4.4 share in the broadest demographic classification: All adults 12 years or older, 6 AM-midnight, seven days a week. Trouble emerges for KFQD, however, when the demographics are narrowed to the key 25-54 age demo stations use as the basis for their decision making and local advertising sales. In that demo KFQD’s weekday local talk shows suffered. 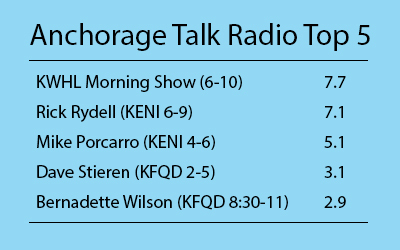 The KFQD morning show hosted by Bernadette Wilson lost ground since the departure of her co-host Ethan Berkowitz to a successful run for mayor of Anchorage. KFQD scored an average 2.9 share for the 8-11 AM time block. That represents a 10% drop in the average number of people listening over the fall ratings period. While the slip may not seem especially troubling on the surface, there are plenty of reasons for concern. First, the slip came on the heels of management cutting the talk show back from 3 hours (8-11 AM) to 2 and half hours (8:30-11 AM) in an effort to pump up ratings by extending their morning news’ ratings strength into the 8 AM hour. The drop also came during the spring ratings period, when local talk typically does better than the fall. Radio Online, an industry site that publicly posts the broadest ratings for stations, shows that over the last two years KFQDs spring ratings are about 25% higher in the spring than in the fall. Of greatest concern for station management has to be the morning show was undoubtedly aided by a firestorm of media attention from the Anchorage mayoral race right in the middle of the ratings period. In spite of these multiple “tailwinds” the morning show still slipped. In addition to ratings problems there are also indications station management may not be happy with what they are hearing on their morning show. 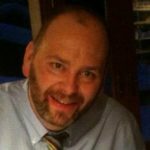 In an interview with TMS station manager Joe Campbell explained management is trying to define KFQD’s niche among the five local news-talk format radio stations as less focus on insider politics and more general community issue and pop culture talk. That means less inside baseball state legislature talk and moving away from hot button political issues like Obama, abortion, gays, guns and GOD. This market niche approach is perfectly exemplified by the content mix on KFQD’s afternoon show. Those topics however appear to be exactly what Wilson is driven to cover. It remains to be seen if she can make the switch. Several of the station’s fill in hosts informed TMS that station management expressed to them dissatisfaction with the direction of morning show with one even indicating management inquired about their interest and availability in taking over the show. Campbell for his part said no change was in the offing at this time, but did acknowledge that the next ratings book would be “very important” for Wilson. While the morning show has its issues, KFQD management has to be equally concerned by the slide in their afternoon show’s ratings. The Dave Stieren Show, once a ratings powerhouse scored only an average 3.1 share. That put the afternoon show only slightly ahead of the morning show’s ratings. This is compared to 2012 when Stieren averaged an 8.6 share for both the fall and spring ratings books and peaked just over a 10 share during the 4 PM lead-in to the KTUU news at 5 PM. This time around the 4 PM hour only garnered a 2.7 share. Stieren was even beaten soundly by KENI host Mike Porcaro during their overlapping 4PM hour, a rarity during Stieren’s time in the afternoon. The ratings may be particularly concerning given they come on the heels of a pedestrian Fall 2014 ratings period when Stieren only scored ratings in the mid 4 share range. KFQD management says they are content to wait for the next ratings book before growing overly concerned. While Campbell acknowledged what he called “erosion in the target demo” for the afternoon show, he was quick to say the data was skewed by bad sampling he called “terrible” and thus should not be the basis for any decisions. It’s worth noting the ”terrible” data, however, didn’t seem to stop talk shows on other stations from putting up their expected numbers. Overall, both KFQD hosts face an important ratings period starting in mid-September. Wilson will need to show she is capable of holding broad interest listeners without the benefit of a marquee name and moderating voice sitting across from her. Stieren will have to show the last few books were an aberration. Both will have to do it without the help of election drama to fall back on and in the face of a traditionally more challenging fall ratings period. While it is hard to see KFQD replacing Stieren outright given the show’s past ratings strength, Stieren’s own demonstrated ability to adapt his content to match changes in station branding, and the his show’s continued commercial success. Another bad book, however, could force KFQD to more aggressively market the show or tweak show content. It could even land Stieren a co-host. As for Wilson, a bad book likely sees her radio show join her previous tv show in media heaven. The good news for KFQD talk show hosts is that while they aren’t in the top tier of talk show ratings, they aren’t in the bottom either. Local talk shows on KOAN didn’t even register significantly in the ratings (they never do). Michael Dukes, who TMS thinks does an excellent show, still has yet to catch on, registering only a .4 share for the last two hours of his show. KENI ratings were in line with past performance. Rick Rydell averaged a 7.1 share in the morning with Mike Porcaro averaging 5.1 in the afternoon. Of course, the big winner in the Anchorage talk show game is the guy who pretends he isn’t in it. No, that isn’t an ancient Tibetan talk show proverb. Bob Lester’s KWHL morning show cleverly masks its heavy dose of local political talk content with toilet humor. That is apparently a winning formula scoring best with an average 7.7 share. He did particularly well during the 7-10 AM hours where the show scored an impressive 9.4 share. That is pretty much the norm for Lester. 5 Comments on "Local Talk Radio Ratings Are Out. Who Is Way Down?" I value talk radio â€œwarts and allâ€. It is a valuable forum available to those without the means (i.e. money) to gain access, even if indirectly, to the political process. Radio KFQD has truly evolved into radio “KGOP” and it shows in these ratings. An ever-present political agenda makes them the ADN of talk radio. Perhaps a radio host who is also in the business of public relations must struggle to give even the appearance of objectivity. Also, I understand why the host in last position in the ratings is in that position. If you want an exercise in frustration call with an opinion that doesn’t support the “party line” and you will soon find yourself off the air. Agreed, but they sure do beg you to call in; challenging is a better adjective. KFQD is really more representative of the hysterical wing of the Alaska GOP, the kids table where Minnery, Bernadette and Eledge are relegated to. Having Lynn Willis comment on this site is a measure of success I welcome. Remember Dan Fagan? I don’t.